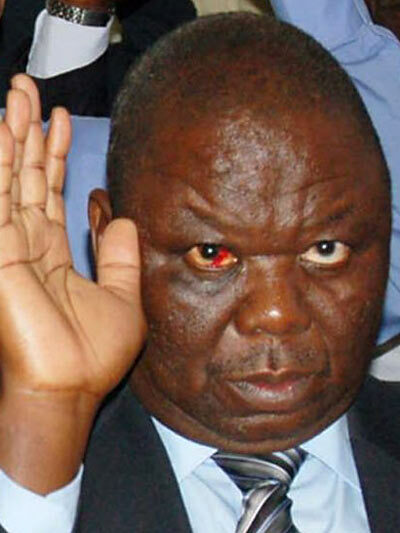 Former Prime Minister's Morgan Tsvangirai's MDC-T party could be headed for an implosion following sensational claims yesterday that there are officials in the party that have a grand plan to kick Tsvangirai from the helm of the party. The plotters, according to Obert Gutu, a senior MDC-T official, have been working towards this goal well before the elections and could have played a part in the party's dismal electoral performance. In a no-holds-barred tirade against Tsvangirai's alleged enemies, Gutu declared a "gloves-off" all-out war with them, threatening to expose them and warning them "enough is enough". Gutu claimed on his Facebook wall that the group — comprising of people that "think they are very intelligent" — had been holding meetings "nicodemously at a dingy lodge in the Avenues area" where the plot to ensure Tsvangirai did not get to State House was hatched and developed. Gutu, the former Justice deputy minister in the inclusive government, said on his page that power-hungry MDC-T officials were masterminding the unceremonial and unconstitutional removal of Tsvangirai. Tsvangirai has steered the MDC-T ship since the party's formation in 1999 and has lost to President Robert Mugabe three times in elections that he has claimed to have been stolen. The 2008 election was rejected by the international community forcing Mugabe to accept to work together with Tsvangirai in a negotiated coalition government. In a strong-worded message posted on his Facebook wall, Gutu said: " . . . these shrill sounds from some sickly fake democrats calling for his (Tsvangirai) unconstitutional removal from office simply won't cut." Gutu labelled those calling for the removal of Tsvangirai as "fake democrats (clothed) in sheep skin". The MDC-T Harare provincial spokesperson, who acted as Tsvangirai's chief election agent in the July 31 harmonised elections, following the incarceration of Morgen Komichi, described party members pushing for Tsvangirai's resignation as "fake cadres and turncoat democrats". "Publicly, they lampoon and lambast how July 31 was stolen, but we know that deep down their hearts, they never wanted Morgan to get to State House. They hold meetings, nicodemously, at some dingy lodge in the Avenues and some other such places where they scheme and plot. "They cannot be trusted. They never mean what they say nor say what they mean. They speak in forked tongues. They are rabidly power-hungry. Enough is enough. The gloves are off. We will match them pound for pound. They might think they are intelligent, but, of course, some of us are smarter and more intelligent than them. We will expose them for what they really are." Contacted for comment yesterday, MDC-T national spokesperson Douglas Mwonzora said: "We are not aware of the plot (to unseat Tsvangirai). We are not aware of those meetings (being held nicodemously at dingy lodges in the Avenues). The standing committee, the national council and the national council decided that all issues relating to leadership must be dealt with in terms of the party's constitution, which means at the next congress of the party." Tsvangirai's spokesperson Luke Tamborinyoka also declined to comment saying: "Mr Tsvangirai has no comment to make on that. Mwonzora should be able to comment on that. He is able to give the party's position on that." Nelson Chamisa, the party's national organising secretary, said: "Please talk to Mwonzora about that. He is the party's spokesperson and he is able to talk about that. I only comment when it's absolutely necessary." Tendai Biti, the secretary-general of the MDC-T, declined to comment on the matter, referring questions to Mwonzora as well. NewsDay called Gutu asking him to elaborate on some of his claims, but the lawyer said he did not wish to go into further detail. "No, I am not going to talk about that now. I am not going to discuss that," Gutu said. On Monday, some MDC-T councillors in Kwekwe, Redcliff, Mutare and Victoria Falls took a move that shook the party when they voted for Zanu PF candidates in elections to select mayors, deputies and chairpersons of local authorities. The apparent revolt by the party councillors, who had explicit directives to vote in a certain manner, was described by Mwonzora as "a very strange development". Analysts yesterday said the development indicated that the party was in turmoil. "It's problematic. It creates problems and exposes leadership problems. It's a threat to the stability of the party though it (the party) has indicated that it would discipline those who did so," said political analyst Ernest Mudzengi. Another political analyst, Charity Manyeruke, said: "At the moment MDC-T is still in a state of confusion. It might lead to their downfall if they are not careful. It indicates serious problems which could lead to the party disintegrating." Manyeruke, however, believed the MDC-T councillors' defiance signalled a paradigm shift saying they opted to settle for worthy candidates and refused to follow the party's whipping system. "It shows us that in council they are looking at leadership qualities, which is what we need as a country," said Manyeruke. Political analyst Ibbo Mandaza said: "It happens across political party lines. Local issues happen to be above politics. People look for a candidate who can tackle issues best such as service delivery. I know many cases where Zanu PF voted for MDC-T."